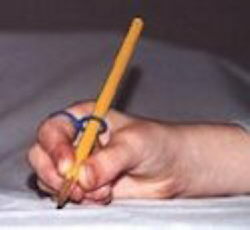 Designed by Mary D. Benbow, a ring with a pencil loop attached to shift and stabilize the position of the pencil in order to decrease index distal hyperextension or "white knuckle" pain when joints are unstable. Also encourages tripod grasp and pencil slant towards the body. Sizes come in small, medium and large left or right hand.